Meet the adults who’ll be heading out on tour with Matilda The Musical throughout the UK & Ireland. 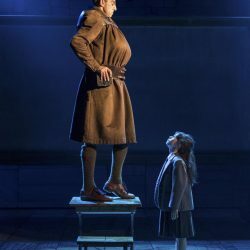 We’ll be welcoming back West End cast members Craige Els and Rebecca Thornhill, reprising their roles as Miss Trunchbull and Mrs Wormwood. Alongside them, Carly Thoms will play Miss Honey, and Sebastien Torkia joins as Mr Wormwood. We quizzed the four principals on their Matilda The Musical and UK knowledge! Joining them in the adult cast will be Joe Atkinson, Peter Bindloss, Oliver Bingham, Emily Bull, Matthew Caputo, Samara Casteallo, Matt Gillett, Michelle Chantelle Hopewell, Sam Lathwood, Steffan Lloyd-Evans, Charlie Martin, Anu Ogunmefun, Taylor Walker, Adam Vaughan and Dawn Williams.